Number one Big NO NO, don't sit around in silence. I suggest you play the menu game. 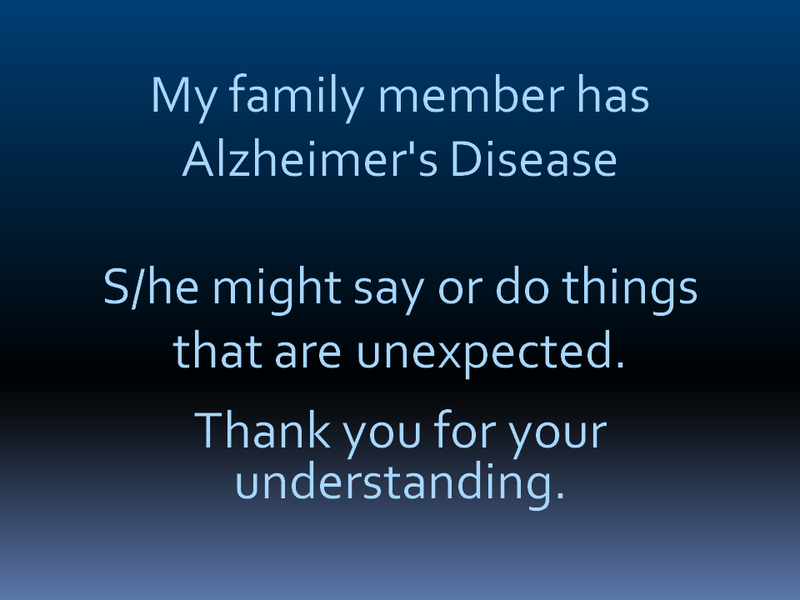 Several years ago I wrote, Alzheimer's Caregiver Lament -- I Can't Take Her Out because She Eats with Her Hands; and. now I am once again reminded how very difficult it can be for care partners to take their loved one out to eat. One of the biggest problems care partners face is the stigma attached to Alzheimer's disease and dementia. For certain, this can be a very big emotional and psychological hurdle and barrier for caregivers. Some caregivers overcome this obstacle by carrying a card they can hand to service people, or people they encounter while out. 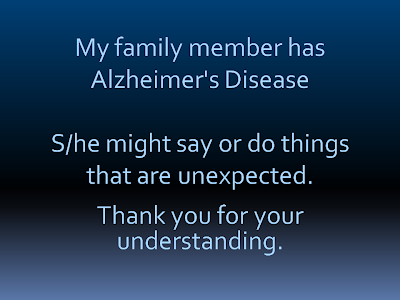 You can go to this Google images page to get ideas and examples - My family member has Alzheimer's. With Dotty I learned it is essential to have a good plan before you go out to eat. For example, I learned early on that taking Dotty out to a "fancy" restaurant was not going to work. A place with booths is often a good idea. I was not surprised when I took Dotty to a crowded place at how quickly she adjusted. Adjusted is the keyword here. Sometimes you have to be patient and understanding. So after a couple of trips to the Banana Boat Dotty adjusted and we had our number one go to place. We went there most Friday's. It was in the BB that Dotty met her new dementia friends. No, her friends didn't have dementia, they were wonderfully kind people that talked to Dotty each and every time we visited the Boat. I would suggest that if the person living with dementia knows a restaurant well and it is not too fancy, go there. It is always best to establish a go to place. The staff will get to know you and they will be kind. Easy access will become an issue sooner or later. This is especially true if you have to wait, etc. The table or booth should be easy to get to, and you should not have to "shimmy" through tight spots. If the service is slow, or not quick, I suggest you play the menu game. I would discuss the menu with Dotty and ask her to read items on the menu to me and then I would ask her if she liked that food. Number one Big NO NO, don't sit around in silence. Your stomach will start hurting and it will get very trying. I know this because it happened to me several times in the beginning. Eat outside when you can. McDonald's is a good alternative. Restrooms can be an issue. Keep that in mind. Many of you might want to carry a change of cloths around with you. Give this some thought. Don't be hesitant to order for your loved one. I would say, my mother will have the white clams with linguine, and I'll have the veal parmigiana. Easy enough. Think positive. Find a restaurant with good, kind, understanding staff. Let me tell you, once you get this right you will feel so good when out. Understanding people that work with you can make your day. I know this to be true because it happened to us over and over. Believe it or not there are lots of wonderful people out there and they out number the jerks. Those are just a few of my ideas for eating out. I can tell you Dotty benefited from being out in the world and it really helped her attitude and behavior. Dotty like to go out, so we just kept right on going out. If you have ideas or suggestions please put them in the comments section below. If you have a good or funny story about eating out send it in for publication. Send it directly to me at rtdemarco at gmail.com. Put these two words in the subject box of the email - Article submit. Don't be reluctant to share your stories. We want to hear from you. The we means the Collective Brain of the Alzheimer's Reading Room. In other words, we all want to hear from you. Bob DeMarco is the Founder and Editor of the Alzheimer's Reading Room (ARR). Bob is a recognized influencer, speaker, and expert in the Alzheimer's and Dementia Community Worldwide. The ARR Knowledge Base contains more than 5,000 articles.